Cons: - only 1 SATA 3 port- 4 USB ports in back- 2 USB3.0 ports in backThese cons may irk some users. I used this for a Linux/Win7 build. Currently using a Pentium G630, G.Skill 8GB DDR3-1600 and GT440 on it. The G630 CPU cannot utilize the 1600 RAM and downclocks to 1066 with tigher timings. Comes with Lucid MVP for hybrid graphics, hadn't tested it yet. For a cheap, simple build, it does the job quite nicely. So far, no complaints about it.This board is more meant for business application than anything else, so don't expect huge things from it. 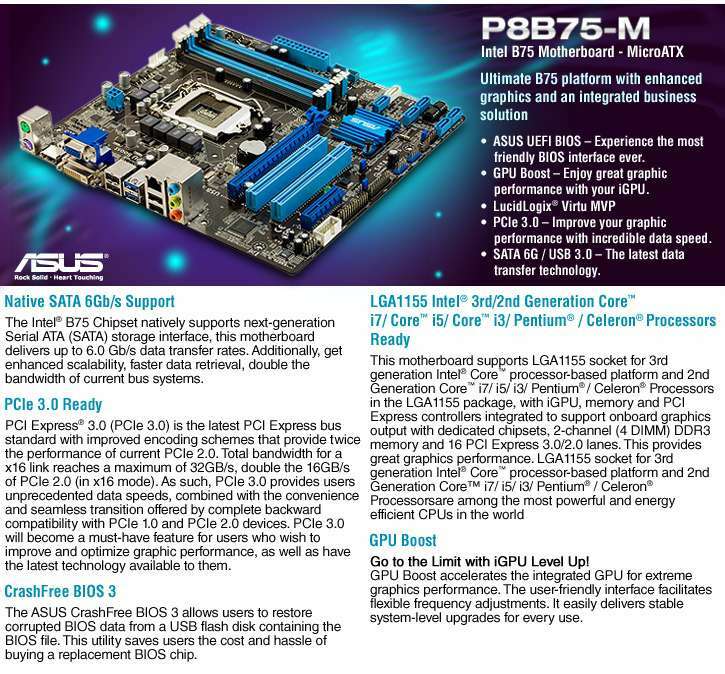 Enhance your business performance with the ASUS P8B75-M/CSM Intel B75 Motherboard. This integrated business solution offers to boost your productivity and your PC’s graphics performance. It efficiently runs programs and applications using a 3rd or 2nd Generation Intel® processor and an unbuffered DDR3 memory, while its SATA III and II ports manages data between your PC and compatible hard drives and optical drives. For excellent graphics on your PC screen, GPU Boost technology increases the performance of the included GPU. Other features include ASUS UEFI BIOS, a Gigabit LAN port, and two USB 3.0 ports. Get the most out of your PC by installing the ASUS P8B75-M/CSM Intel B75 Motherboard.